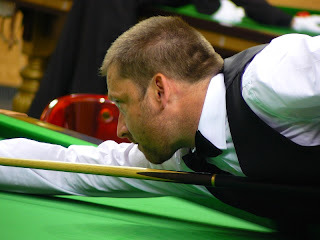 European Snooker Championships 2012 - Daugavpils, Latvia: Miss the Miss Rule? You can be sure that there is one rule in snooker that will divide opinion, and that is the miss-rule or the various interpretations of it. Sadly in my opinion this rule is ruining the game I love. There was some healthy discussions on the rule when I took the opportunity to express my opinion on the current miss rule to the various referees of all nationalities at our European event this week.This is how I see it. "We only enforce the rule, the player can choose to accept the miss or not" was one of the views expressed by a very senior tournament referee. 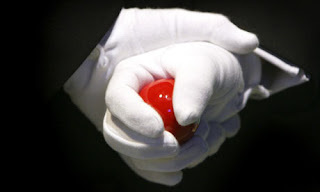 All well and good, however I have witnessed players lay a good snooker, then sit back and wait for the points to role in, irrespective of (a) how close the opponent came to getting out of the snooker or (b) being left a simple pot but refusing to take the shot as he full well knows (c) the points will continue to accrue while the referee enforces the rule. Laughable. 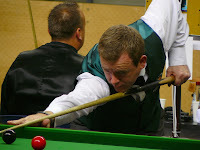 In the scenario above, following a foul stroke and the obligatory 'miss' call, I have witnessed players turn down laughably easy shots and with that frame winning opportunities, just to have the ball replaced so their opponent can 'gift' them another four easy points, one step closer to getting over the winning line. Two points on this. Who decides whats an easy shot? In my opinion, the referee needs to make that call. We are all international players, with a better than average degree of skill around the green stuff, and I for one would appreciate some input from my match referee on this other than "it's up to the player"....no, its up to the referee, take the decision making ability from the player by not calling a 'miss' in the first instance. Lets give our hard working referees more authority other than..."I just enforce the rules" and allow them, no encourage them, to take a more proactive role in our game. "Sorry Ref, I'm only here as I'm the best my country has to offer, and that easy red hanging over the middle pocket I've been left? Don't think I can make it, replace the balls please, its a miss". Second point, same scenario. I'm for one not traveling thousands of miles around Europe to deliberately try to deceive or con my opponent or the referee by playing a deliberate miss. 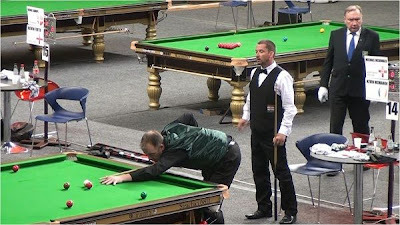 I'm playing the game for the love of it, and unlike the professional game there is not thousands of pounds riding on the outcome of one frame of snooker. It galls me that currently, in any frame I play, utilizing the skills (or not) developed and honed over years of practice, I can build and develop a healthy frame winning lead only to see this decimate 4 points at a time because (a) the referee is 'enforcing the rules' (b) my opponent just wants to use the opportunity he has been given to accrue as many easy points as possible or (c) its somehow implied that I am deliberately giving away my hard fought lead, I've just missed my last attempt and left a ball hanging over the middle bag for $%& sake. Don't get me wrong folks. There is a need for the miss rule in our current game. However we need to differentiate between the pro and amateur games and the level we are currently playing at, and not loose sight of why the rule was called for in the first place. I for one don't want this rule ruin the sport I love. What do you think? PS...In my blog post yesterday I praised our Belarus referee Tatiana. And rightly so, here's why. I did leave Frank (my opponent) one of my fiendishly difficult snookers, which he attempted once to get out of, and failed. "No Miss..." well done Tatiana, again. Another referee and it could have been a very very long night.